a data stream that represents the particles and their coordinates. In a more universal view, the question is whether a person's essence or soul has a physical nature or whether it can be reduced to mere data. The question is even explicitly posed (but not really answered) in ENT: "Daedalus". Furthermore, much the same question crops up in episodes in which a conscience is transferred, like in TOS: "What are Little Girls Made of? ", "I, Mudd", "Return to Tomorrow", "Turnabout Intruder", "Star Trek: The Search for Spock", TNG: "The Schizoid Man" and several more. "An energy-matter scrambler, sir. The molecules in your body are converted into energy, then beamed into this chamber and reconverted back into their original pattern." "After all, the holodeck is basically an outgrowth of transporter technology, changing energy into matter and back again every time a program is run." We get some more insight into the technology of the transporter in the TNG Technical Manual, where the opposite appears to be true - the transporter transfers the object's very matter. In this case a person is not going to "die" when being dematerialized, but is only changing consistency from a solid to a matter stream state (whatever this is supposed to mean in a physical or biological sense). Bearing in mind that regular television exists since 1936, whereas the first commercial video tape recorder appeared as late as 1972, this development appears plausible. Barclay conscious inside the transporter in TNG: "Realm of Fear"
In TOS: "The Enemy Within" Spock states about the dog who died when his two halves were re-assembled: "The shock of putting him back together seems to have been too much for him." In "Star Trek II" Kirk and Saavik keep talking during the procedure. Likewise, in "Star Trek IV", we hear Jillian Taylor scream practically during the whole transport cycle. In "Star Trek VI" Kirk is beamed up from Rura Pente cursing and carrying on about his ill-timed rescue. In TNG: "Contagion" Picard speaks while he is dematerializing on the Romulan bridge. In TNG: "Realm of Fear" Barclay is able to grab someone while in the transporter beam. 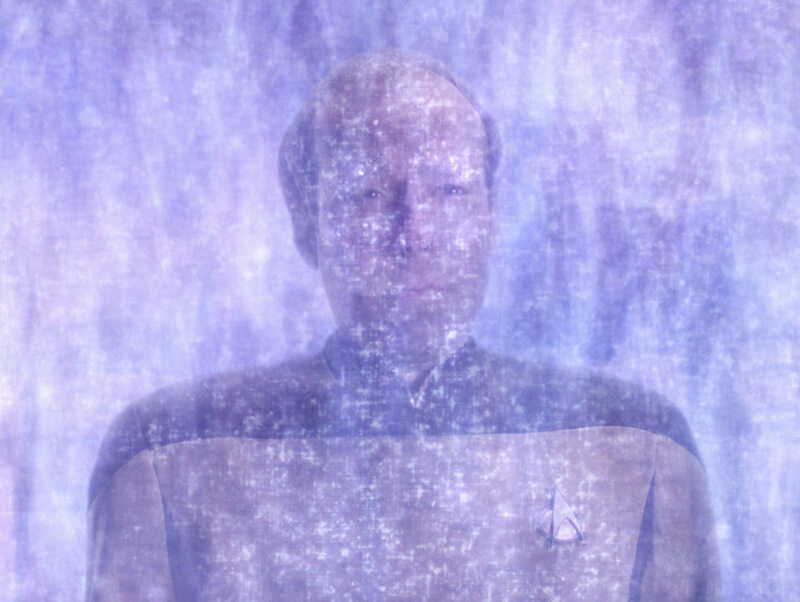 Scotty's pattern has remained intact in the transporter beam for more than 70 years in TNG: "Relics", although we don't know if he remained conscious. In VOY: "Future's End II" Henry Starling has a device to disrupt the transporter and keeps it activated while in the transporter beam. Matthew Ryan has never been transported, but in ENT: "Fortunate Son" he says: "They say that, for a split second, you can actually feel yourself at both places at once." In ENT: "Countdown" Hayes is being shot while he is already dissolving. In ENT: "Storm Front, Part I" Archer and Alicia are beamed up form Earth while Archer taunts the alien Nazi. Ultimately the disappearance of Emory Erickson's son Quinn in ENT: "Daedalus", who is moving all the time while in the matter stream state (in which he had been for 15 years), proves that a person in a transporter beam is alive all the time. Dr. Phlox can even record Quinn's vital signs before he has materialized. How biological functions may continue to work all the time without being able to breathe and to eat is still another question. In "Star Trek Into Darkness" Carol Marcus keeps running after her father has already locked the transporter beam on her and she begins to dissolve. Most notably in the TNG episode "Second Chances" another Riker materializes from a second beam. TNG: "Lonely Among Us" it is stated that Picard was converted to pure energy when he beamed himself into the mysterious cloud. On the other hand, his physical pattern is still being stored in the pattern buffer, so it is possible to reassemble him. 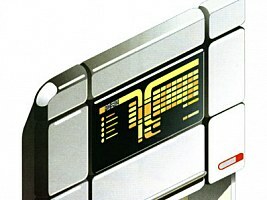 In DS9: "Our Man Bashir" the patterns of Sisko, Kira, Dax, Worf and O'Brien are stored all over the station's computer system as if they were pure bits. In TOS: "The Enemy Within" and VOY: "Tuvix" the transporter must have taken additional matter from somewhere, as one Kirk and one Tuvix, respectively, was split into two individuals. In a similar fashion, the kids in TNG: "Rascals" were restored to twice as heavy adults using the transporter. Lately, in the real world an experiment succeeded to transfer the quantum state of a photon, which was called "quantum teleportation" in the press. The state of the original photon was changed and therefore lost in the operation to determine this very state, but the result could be transferred and applied to a second particle which did assume exactly the same state. The state itself remained unknown because of Heisenberg's uncertainty principle. Could this be how the Heisenberg compensator works? This device seems to be a key component of the transporter, and it was "invented" by the authors after criticism from physicists that it wouldn't be able to resolve the quantum states because of the Heisenberg uncertainty. It is questionable if the procedure of "quantum teleportation" can be applied to macroscopic objects likewise. Actually, a technology to scan, disassemble, let alone reassemble an object like a human body doesn't even exist in theory. Anyway, if this were possible and each particle would undergo the same treatment as the above photon, the quantum transporter would transfer data bits, but would still not be able to produce a copy of the beamed object, since its original quantum states have to be read destructively. The transporter will -unfortunately- never work the way it is shown in Star Trek, even if transporting macroscopic matter should be possible in theory. This is on one hand due to the fact that the data volume is unbelievably large, considering the number of particles e.g. in a human body, no matter if real atoms or just bits are transported. In his book The Physics of Star Trek Lawrence Krauss reckons that there are about 1028 atoms in a human body, equaling about 1028 kilobytes of data volume. Even if some kind of 3D-JPEG compression is employed - imagine how a person would look afterwards in case JPEG settings were too progressive ;-) - the bandwidth would be far too high for any present or future channel to be transferred in finite time, meaning something like a few seconds. Storing the data, on the other hand, will not be a major problem if we assume a real-time broadcasting. Even in the case that actually all atoms and their locations were kept stored as bits simultaneously, the required memory might be only a few cubic meters large, just like the transporter buffer, the "tank" on the deck below the transporter platform. The second problem is how the necessary resolution, meaning the distinction between two neighboring atoms, should be achieved if an object is beamed up from a planet surface 40,000 kilometers away - the maximum operation range according to the STTNG Technical Manual. The facts that the device used by Bok in TNG: "Bloodlines" is explicitly called "subspace transporter" and that beaming at warp speed is not recommended suggest that the standard transporter relies on the normal EM spectrum. Thus, the transporter would have to use X-rays with a wavelength of less than a nanometer to resolve single atoms, which would be extremely harmful for the human body. Aside from that, the inevitable diffraction would cause the reconstruction to blur. A low diffraction limit and thereby sufficient resolution can only be achieved with a very large aperture of the "lens" through which the object is scanned and restored - of about the same size as the distance between the planet and starship! The third reason (of probably several more) is that for any matter/data transfer a transmitter and a receiver is required, but where is the receiver on an unexplored planet? In case of such a transport, the matter/data beam would have to stop at the right position for every particle of the beamed object or body. The technology of replicators is supposed to be based on the transporter. This is explicitly mentioned in TNG: "Ship in a Bottle" and DS9: "Visionary". Several other statements concerning "matter conversion" as well as the STTNG Technical Manual suggest that the technologies are related. The transporter converts existing matter to a form that can be transferred over relatively long distances, and vice versa. It is not clear whether pure energy, i.e. an electromagnetic wave, or a "matter stream" is transferred (see above). In any case, the transporter must securely dissolve, transfer and restore extremely complex structures and even living organisms. Compared to this, the specification of a replicator is rather simple. 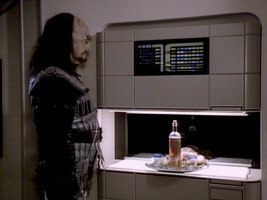 The replicator may predominantly work on a molecular base, which is sufficient to create food or articles for daily use. In most cases recycled matter can be used for replication. The only reason why the replicator might be more advanced is that the a replicator "recipe" is permanently stored, whereas transporter patterns are transferred in real time. Nevertheless, it is not plausible why the replicator should be a spin-off technology of the transporter, invented perhaps as late as one century later. 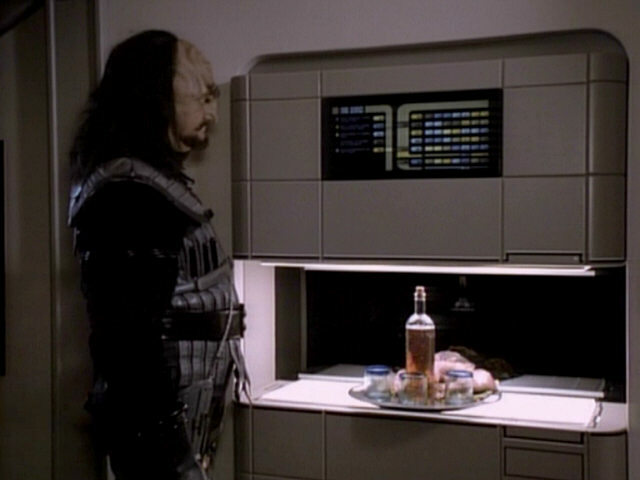 Food replicator in TNG: "Heart of Glory"
TOS had some sort of "food slots" or "food processors" that may have been able to create at least simple meals from raw ingredients. We can see the food processors in the recreation room in TOS: "The Naked Time" and "The Trouble with Tribbles", for instance. There is even a food processor in the transporter room, as seen in TOS: "Tomorrow is Yesterday". In "And the Children Shall Lead" the food processors produce ice cream amazingly fast, as if they were replicators of the 24th century. Based on other evidence from TOS, it is possible that the device only distributes food that is prepared in a conventional kitchen though. Yeoman Rand speaks of the galley as the place where she would normally prepare a coffee in TOS: "The Corbomite Maneuver". In TOS: "Charlie X" Kirk advises the chef to prepare meat loaf for thanksgiving that looks like real turkey (some time later Charlie would actually transform it to real turkey). There is still a galley aboard the ship in "Star Trek: The Undiscovered Country", but maybe this is only used for special occasions. Also, despite the device in the transporter room, no one seems to have a food processor in his quarters. 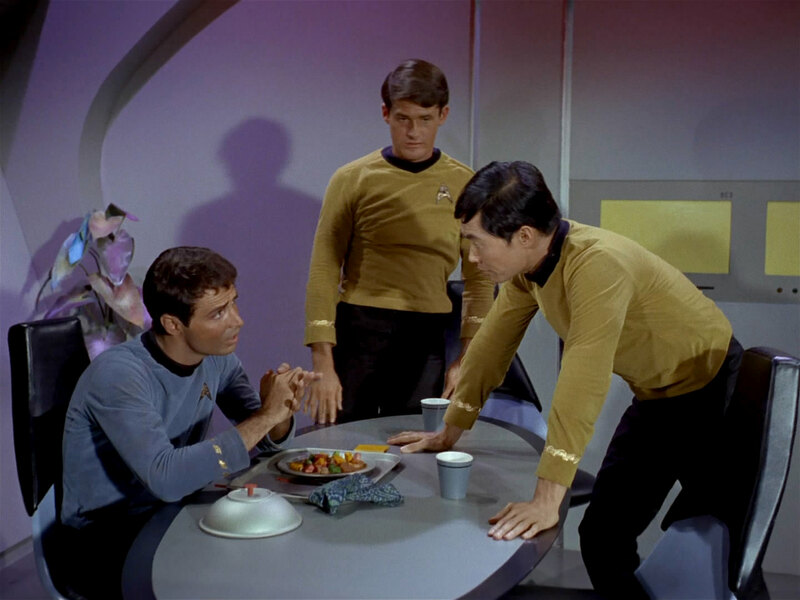 Yeoman Rand routinely serves meals to Kirk and also to Sulu (TOS: "The Man Trap"). Nurse Chapel brings a plomeek soup to Spock in TOS: "Amok Time", and Garrovick receives his food from outside his quarters too in TOS: "Obsession". It seems that the replicator didn't yet exist in the 23rd century, or its capabilities were very restricted, plus they were too large or too complicated to be installed in each room. Food dispenser in TOS-R: "The Naked Time"
In some episodes such as TOS: "The Naked Time" or "By Any Other Name" the food consists of colorful jelly cubes that look quite artificial and insinuate "space food" that would not be cooked in a conventional fashion. In Star Trek Enterprise we see that there is definitely some sort of food processor, a protein resequencer, that can create at least very simple nourishment and yet something tastier than artificially flavored jelly cubes. It is obvious that the Enterprise NCC-1701 must have an equal or rather more advanced technology. At latest in "Star Trek: The Undiscovered Country", ironically the movie in which the kitchen is shown for the first time, there is something closely resembling a 24th century replicator. This is no surprise, since TNG sets of the Enterprise-D were slightly modified to build the interior of the Enterprise-A. In Star Trek "antimatter" more specifically refers to antideuterium, the presumably only form of antimatter that is technically used in the Federation, most prominently for power generation on starships. According to the TNGTM there is a massive antimatter generator aboard a Galaxy-class vessel to produce small amounts of antimatter once the supply is exhausted. This occurs at a very low efficiency of one atom of antideuterium per ten atoms of deuterium. The generator obviously operates unlike a replicator and could be more like a particle accelerator like we already know it today. The so-generated extra supply of antideuterium is supposed to be used only in emergency situations when the impulse reactors are not capable of providing enough power. Irrespective of the existence of the generator which was never mentioned on screen, the question may arise whether antideuterium, or antimatter in general can't be simply replicated. There might be no need for an antimatter generator, and the ship would never run out of antimatter. Side note In VOY: "Threshold", when the Doctor needs to treat the mutated Lt. Paris with antiprotons, B'Elanna mentions that the only place on the ship where antiprotons are generated is the warp core. But here the antiprotons are apparently just a by-product of the matter/antimatter reaction, and probably radioactive waste. Security concerns may be one reason why antimatter is not replicated, much like it can't be moved with the transporter "without extensive modifications...", as stated in the TNGTM. Antimatter was transported a couple of times though, like each time when a shuttle was beamed in or when the photon torpedo was transported onto the Borg vessel in VOY: "Dark Frontier". But considering that a perfect magnetic confinement must be maintained during the whole generation process, it may be generally considered safer to guide a well-defined magnetic bottle of antimatter through the system than to execute a process with antimatter involved in the replicator. We also have to bear in mind that beaming out the antimatter would have prevented many warp core breaches, yet targeting the instable core with the transporter was not even considered an option. There is, however, a fundamental rationale why replicators can't create antimatter. According to the TNGTM the replicators perform "molecular synthesis", meaning that they rearrange substances on the molecular level. Replicators are a form of nanochemistry. In order to replicate anything, they require the same amount of the same type of matter as raw material. They are not capable of creating matter from pure energy, although this may have been stated once or twice on screen -- but even the transporter, which almost definitely doesn't work like that, was occasionally said to perform an energy-to-matter transformation. Replicators are not capable of generating particles from their antiparticles either for which they would need to magically revert the charges of all elementary particles. Some alien technologies like especially particle synthesis (VOY: "Hope and Fear", "In the Flesh") may be more powerful and may create any form of matter from any other form of matter or from energy. Hence the name of the technology which was said to be more advanced than replication. 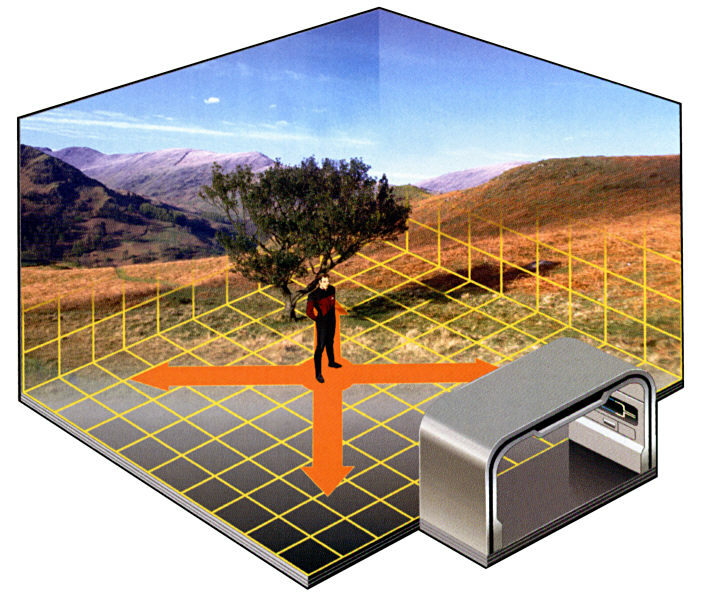 The holodeck consists of two main subsystems, a holographic imagery system and a matter conversion system (TNG Technical Manual). The imagery system, with the omnidirectional holodiode (OHD), provides a projection of light and can be used to display objects that are not supposed to interact with the holodeck users and are usually "far" away from them. A second version of the OHD can be employed to project a forcefield, thereby allowing interaction. The matter conversion system, on the other hand, is used for anything that is likely to be touched, eaten, drunk or taken out. Holographic grid in TNG-R: "Hollow Pursuits"
This explains why some objects created in the holodeck just disappear when they are taken outside, while others continue to exist. In TNG: "The Big Goodbye", for instance, the mobsters who tried to leave the holodeck vanished a few meters outside, whereas the holographic lipstick remained on Picard after he left in the same episode. In TNG: "Angel One" Picard was hit by a snowball outside the holodeck. Also, Data could take the sheet of paper with Moriarty's drawing of the Enterprise to the observation lounge in TNG: "Elementary, Dear Data". However, according to the TNG Technical Manual holographic characters are actually a combination of forcefields and real replicated matter. Kira confirms this notion in DS9: "The Way of the Warrior". They would not cease to exist outside the holodeck, but would only be without forcefield control. So why did Cyrus Redblock disappear in TNG: "The Big Goodbye", unless he was a mere projection? ...unlike a sheet in TNG: "Elementary, Dear Data". The Star Trek Encyclopedia II supplements that "holodeck matter" includes holographic characters, as also hinted at in TNG: "Elementary, Dear Data", where Pulaski told Moriarty that he would vanish outside the holodeck. "Holodeck matter" is supposed to be "a partially stable form of matter, created by transporter-based replicators, for use in holographic simulations" and would degrade into energy outside the holodeck - exactly what happened to the hologangster. Yet, this holomatter doesn't comply with the description of the holodeck principle in the TNG Technical Manual. It would be a third, intermediate method of creating objects in addition to mere projections and real replicated matter. A similar impression is created in TNG: "Ship in a Bottle", where it was tried to beam Moriarty out (who was hoping to find a way to leave the holodeck ever since he gained self-awareness), as if his consistency had to be stabilized (using pattern enhancers). It might have been a ruse, though. Another point is that one can't get drunk from holographic wine (VOY: "Parallax") according to Tom and that alcohol in the holosuite "is not the real booze" as Vic Fontaine says (DS9: "His Way"). Either it is synthehol anyway, so it wouldn't matter if it was created in a holodeck or a replicator, or it is the mysterious "holomatter" again. Side note In the cut ending ofTNG: "Elementary, Dear Data" Data revealed to Pulaski that Moriarty would indeed have been able to leave the holodeck just like the piece of paper, because for some unknown reason the computer created him to be permanent. This means that up to this point everything created in the holodeck was meant to be transitory (although the lipstick and the snowball are two precedents of permanent matter from the holodeck). Still another point is why most holographic characters are composed of (holo-) matter, whereas Voyager's EMH is definitely a "simple" (he would protest about being simple ;-)) projection of light and forcefields, as he claims himself. Since the Doctor works perfectly, it is not plausible why other holographic characters consist of "holo-flesh", provided that holomatter exists at all. 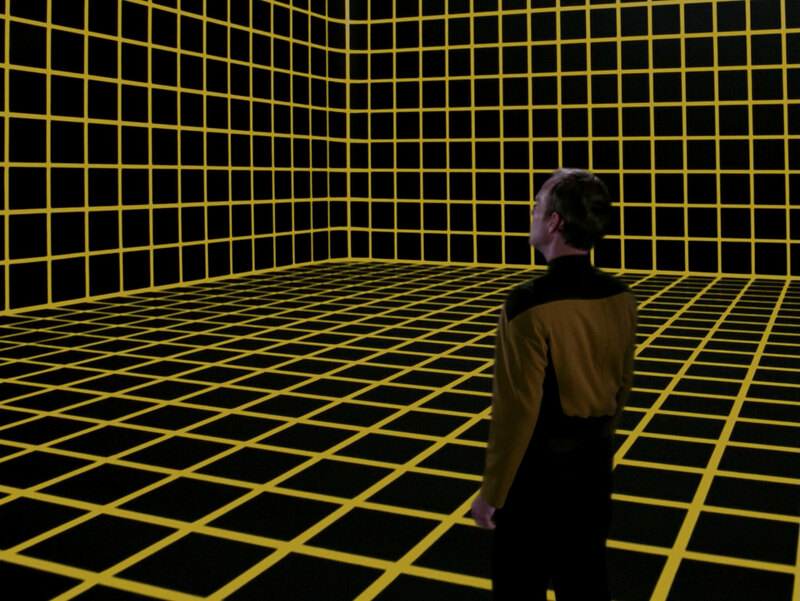 Obviously many holographic environments are much larger than the holodeck itself. This can be explained with a "treadmill" effect that scrolls the simulated environment as a person is moving within the holodeck, as Data explains to Dr. Pulaski in TNG: "Elementary, Dear Data". This might work perfectly if there are only few persons, and if they stay close together. But what happens if they move far away from each other? 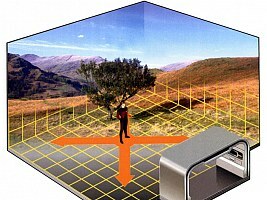 In this case the holoprojectors would have to create a different environment for each person, and at some point the room to create the illusion would become too small. Most obviously, this should have been the case in TNG: "Homeward" when Nikolai Rozhenko transported a whole village population, at least a few dozen people, into a holodeck. A different size problem becomes obvious in VOY: "The Killing Game" where the wall of a four-story building was blown away with the safety protocols disabled. 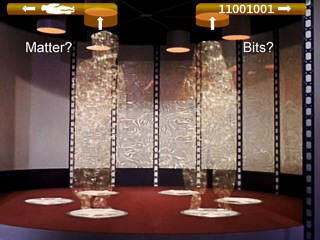 It was actually the wall of the holodeck itself, and four decks became visible. 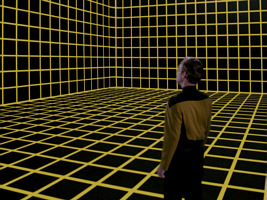 It may be doubted that Voyager has such a large holodeck. The dialogue mentioned that the holodeck was being extended, but it looked like Harry Kim was just installing emitters in various corridors. We have seen a power failure in VOY: "Night" when Tom and Seven were trapped in the "Captain Proton" simulation during an alien attack. Instead of the expected immediate disappearance of all projections (which can be supposed to require a permanent power input), the hologrid was "frozen". The scenery was still being displayed, as if everything was replicated and therefore physically present. Even the active EM filter converting everything to black & white was still functional. Moreover, Seven managed to disable the safety protocols and used a "ray gun" (apparently a replicated object, see below) to disable an intruding alien. All this doesn't comply with the known principle of the holodeck. Although the holodeck has proven helpful in solving engineering problems (TNG: "Booby Trap") or criminal cases (TNG: "A Matter of Perspective"), its principal purpose appears to be recreation. Anyone of the crew of the Enterprise-D or Voyager seems to be allowed to use the holodeck any time, and without any special precautions. Even children repeatedly enter the holodeck all alone. This is deemed possible because the safety protocols preclude the creation of any objects or any situation that may be hazardous or even lethal. The safety protocols, however, fail frequently, thereby putting the users in great danger. The first time that holodeck safety protocols are hinted at (but not explicitly mentioned) and the first time they fail is in "The Big Goodbye". It appears that the holodeck safety protocols go offline after the scan by the Jarada, which somehow interferes with the computer's operation. 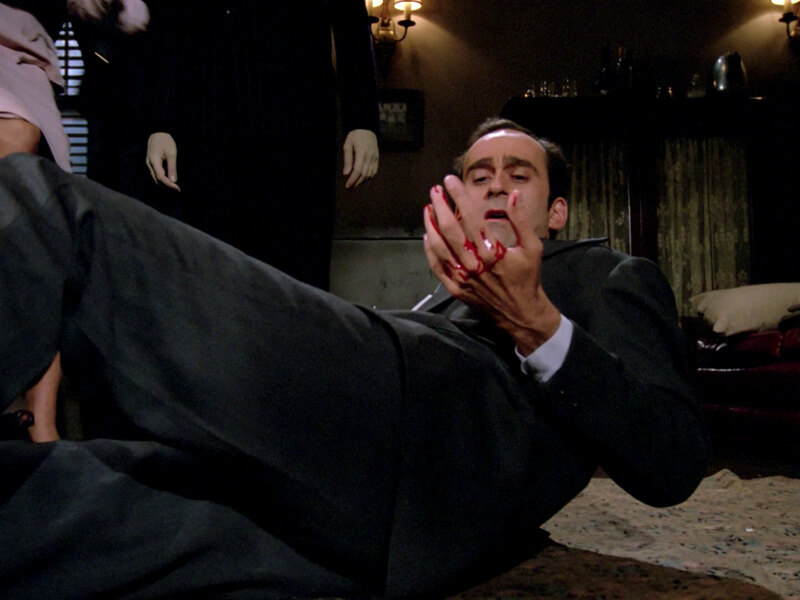 Instead of something harmless, or nothing at all, there is apparently a real projectile in the gun that the gangster Leech fires, much to Whalen's surprise when he gets hurt. This accident is still rather plausible but sets an unfortunate precedent for future episodes, which repeatedly show us dangerous weapons created on the holodeck. 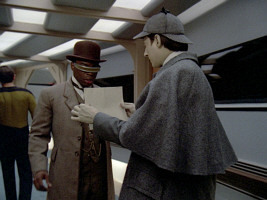 In TNG: "Elementary, Dear Data" a "mortality failsafe" is mentioned that prevents the holodeck from creating something dangerous. 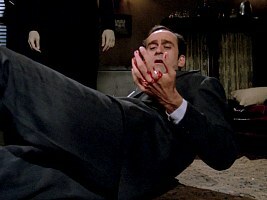 This is obviously the same as the familiar safety protocols. A special case of a safety protocol failure occurs in TNG: "A Matter of Perspective". Here the holographic reconstruction of Apgar's reactor interacts with a real field generator on the planet that recharges and emits in fixed intervals, thereby endangering the ship. The recreation of the reactor on the holodeck is harmless per se but dangerous in the interaction with the outside world. It is obvious that the reactor has all the functions of the original so it can become a part of the real world. We can also conclude that the holodeck walls neither block the incoming radiation from the planetside generator, nor the outgoing energy of the reactor. More inadvertent safety protocol failures occur in TNG: "A Fistful of Datas" (due to Data's tampering with the computer), TNG: "Emergence" (in the course of the creation of a new lifeform on the Enterprise), DS9: "Our Man Bashir" (apparently because of an "out of memory" condition after the transporter patterns of Sisko, Kira, Worf, Dax, and Miles O'Brien have been stored) and VOY: "Heroes and Demons" (Tuvok mentions the possibility when the Doctor is trapped on the holodeck). VOY: "Bride of Chaotica! ", where photonic lifeforms are killed on the holodeck is a special case, considering that these were obviously not recognized as being alive (although very similar photonic lifeforms already appeared in "Heroes and Demons"). 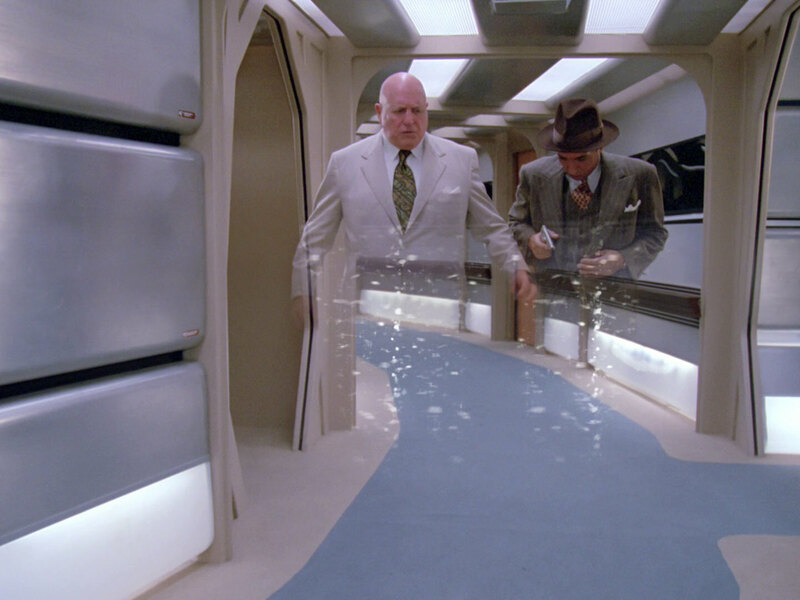 Finally, the by far most idiotic holodeck failure of all times occurs in VOY: "Spirit Folk" when a holographic(!) bullet hits a control panel inside the holodeck, thereby destroying the holodeck safety controls. Safety protocol offline in TNG-R: "The Big Goodbye"
The holodeck program can't be terminated. The holodeck doors can't be opened. The holodeck safety protocols are offline. The safety protocols are disabled on purpose on several more occasions, such as in "Descent I" (where Data considers disabling the safety limits so he can experience his fight with the Borg again), "Star Trek: First Contact" (because Picard needs a working machine gun to use against the Borg), VOY: "Worst Case Scenario" (programmed to be unsafe by Seska), VOY: "Night" (where Seven turns a "ray gun" into an actually working weapon) and VOY: "Extreme Risk" (turned off by B'Elanna to improve her experience of orbital skydiving). We can make sense of most of the above incidents under the following assumptions. Each object in the holodeck library needs at least one model on which the holographic recreation can be based. An object can be represented by a physical model that emulates all aspects of its working principle in the real world. In the case of TNG: "The Big Goodbye" Whalen was most likely hurt by a replicated projectile that was fired from a replicated weapon. This may explain why in VOY: "Night" Seven of Nine can turn the "Captain Proton ray gun" into a fully functional beam weapon. Tom Paris could have assigned the physical model of a phaser to the fictional weapon (meaning there could be a real replicated phaser inside the ray gun), although this is a bit far-fetched. 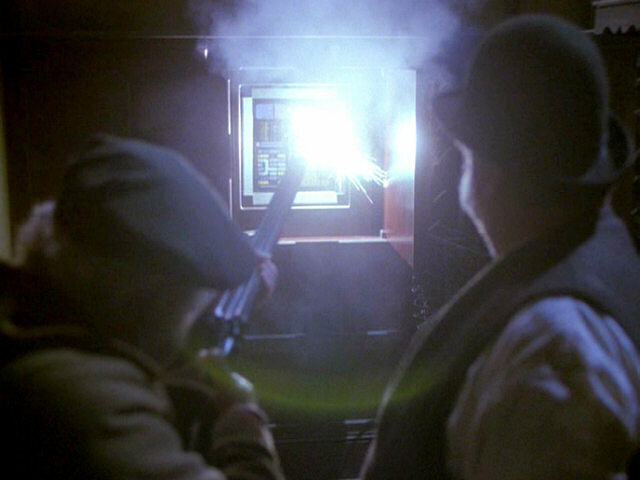 A replicated weapon in the holodeck does not qualify as safe because once fired a considerable amount of energy would be necessary to decelerate it before it can hurt someone. There is no way that real weapons could be normally replicated for a holonovel, whether it's intentional or not. The holodeck would never be approved for recreation or for use by children if this were in any way possible. The holographic modeling may be limited to the look and feel of the object, which could be accomplished by projections and forcefields. Such a simulation can be controlled much better than something like a real projectile, because it would suffice to turn off the power to a forcefield should it become dangerous. The safety protocol usually enforces the use of such a simple and safe projection. The holodeck knows what could be possibly dangerous because there is a category of objects in the library labeled as "potentially dangerous". Whenever new objects are added to the library, the human user usually decides whether it may become dangerous. In addition, the holodeck would take into account empirical data. The generator in TNG: "A Matter of Perspective" slips the net because there is no reason to rate it dangerous per se. The one incident that remains totally unexplained is the one from "Spirit Folk". Here the holographic safety protocols go offline following a malfunction that is obviously only possible if the protocols have already failed. Some screen caps from TrekCore. The idea to link body switching to the operation principle of the transporter comes from Lyle Zynda's essay in Boarding the Enterprise. Thanks to Joshua Bell for some suggestions about the transporter, to DAS for more examples of "talking during transport", to Jack Bohn for some examples of the food processors in TOS, to Zarm R'keeg for a note about "Charlie X", to Ron Valencia for a hint about antiproton generation, to Jan Kockrow for a discussion about holodeck safety and to Jeffrey Smith for a reference about the holodeck..